The 1st Battalion the Royal Gurkha Rifles have done it again. They have become the Army Volleyball Champions 2017. The battalion have now become the Champions for six times continuously from 2012. On 19th April 2017, the Army Volleyball Championship 2017 was held in Aldershot Garrison Sports centre. The championship started at 0900hrs and saw a lot of fantastic competition between the different units. All participants were enthusiastic and put on a great show which pleased the spectators often bringing them to their feet. 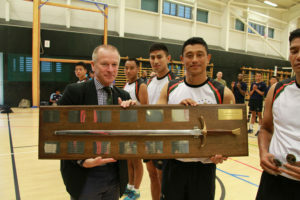 The final results of the competitions placed the 1st Battalion the Royal Gurkha Rifles as winners and 10 The Queen’s Own Gurkha Logistic Regiment in second. The Colonel of the Brigade of Gurkhas handed over the respective prizes at the end of the event. Another proud day for the Brigade of Gurkhas. Sport is critically important to the morale, welfare and operational effectiveness of Army personnel.